This is an abridged translation of La’o Hamutuk’s Tetum-language submission. More information and documents on the 2016 State Budget in Tetum and English is here. We thank Committee C of the National Parliament for inviting La’o Hamutuk to participate in your seminar last week, and offer this submission to reinforce our presentation there. Although the Government has spent a lot of money over the last few years, Timor-Leste’s people still face many problems including malnutrition, hunger and lack of clean water and sanitation, as well as primary education which is far below reasonable standards. The needs and rights of many of our people are still not being met, and we face many challenges in fulfilling our commitment to make people’s lives more equal, equitable and sustainable. This will permanently damage our children's and grandchildren’s futures. A good budget policy will enable the Government to effectively respond to the problems faced by the people of Timor-Leste. To follow this path, it is important that all leaders consider that the principal objective of the state budget is to implement programs which benefit Timor-Leste’s people today and tomorrow. The National Parliament should help the Government avoid policies which focus on ‘execution’ percentages, allocate money to privilege a few people, or pay off companies or special constituencies based on pre-election promises. We need to reorient public policy so that it serves the people and allows us to liberate them, which has been everyone’s common dream for many years. Although Article 30 of the Budget and Financial Management Law states that the Government should have presented the 2016 State Budget proposal to National Parliament on or before 15 October, the budget documents were submitted two weeks later. This reduced the time for Parliament to discuss the budget proposal by 25%. Government worked on the budget for about nine months, with extensive expertise and personnel. The democratic process is undercut when Parliament – which had no information before 29 October – has only a short time in which to analyze, amend and enact it. Parliament is being pressured to approve the budget so that it can be promulgated before the start of fiscal year 2016. We think that Parliament should not reduce its ability to fulfill its constitutional mandate, and that sufficient public hearings should hear ideas which can help to improve this state budget. We believe that is it not urgent to approve it hastily because the law has a duodecimal mechanism in case the budget has not been enacted by the first of the year. Also, if Parliament approves the budget in January of next year, this would encourage the Government to comply with the legal requirement to submit the budget by 15 October in the future. We are also concerned that Parliament is continuing an undemocratic tradition by establishing an Ad-Hoc Committee (Komisaun Eventual). Since this practice began, La’o Hamutuk has observed that this Committee reduces public participation in the budget process, enabling the political elite to reach a consensus and put their own wishes ahead of the public interest. The International Budget Partnership’s Open Budget Survey Report, published in September 2015, showed that the ‘Public Participation’ pillar within the Open Budget Index has fallen sharply in Timor-Leste – we received only 10 points out of 100. Therefore, La’o Hamutuk encourages Parliament to hold a transparent budget discussion, open to everyone, rather than only a few Deputies deciding the future of the people behind closed doors, hidden from the media and the public. The budget must be based on Timor-Leste’s reality. This proposed 2016 General State Budget will spend $1.562 billion, virtually the same amount as in 2015. However, spending for the Oecusse Special Zone (ZEESM) has increased 63% since 2015, and the appropriations for roads, airports and the Tasi Mane petroleum infrastructure Project have almost doubled. These projects continue to dominate state spending, even though their benefits to people’s lives are not clear. According to the budget documents, spending on ZEESM will exceed $1.1 billion between 2015 and 2020, while components of the Tasi Mane Project – Suai Supply Base, Suai airport and part of the highway between Suai and Beaçu – will cost more than $1.4 billion (this figure does not include other components of the project – the refinery in Betano or the gas pipeline and LNG plant in Beaçu). Nevertheless, we believe that the Tasi Mane Project will actually cost much more than this in coming years. At the same time, spending on the three “national priorities” named by the Vice-Minister of Finance – education, health and agriculture – has been cut by 11% in 2016 compared with 2015. The health sector receives only 4.2% of the total budget, while education receives 8.7%, although the number of children reaching pre-primary and primary school-age has increased dramatically, there is a severe lack of equipment and medicine, and disease is widespread. In terms of the economy, the agriculture sector – the livelihood of most households in Timor-Leste –receives less than 2% of the total budget, lower than in 2015 or 2014. It has been cut by 20% compared with 2015. We therefore doubt the Government’s seriousness about investing in productive sectors such as agriculture, tourism and small industry. Although we understand that investment is not only allocating more money, these budgetary limitations will reduce the capacity of the agriculture sector to improve itself. Also, although some money can be saved by reducing waste and increasing efficiency, we think it is unreasonable to reduce priority for the three sectors which could strengthen our human resources and local economy, especially when the money is being reallocated to projects which will do neither. Since 2014, recurrent spending has been more than the Estimated Sustainable Income (ESI) from the Petroleum Fund plus domestic (non-oil) revenues. Every year, the Jornadas Orsamentál workshop sets a fiscal envelope of $1.3 billion, but the final budget is increased to nearly $1.6 billion. Will we continue to lie to ourselves until our Petroleum Fund is completely empty? Do not continue unsustainable spending. La’o Hamutuk’s submissions to Parliament have often pointed out that Timor-Leste should be cautious about spending, as the Petroleum Fund is our only resource to finance the State Budget. The Petroleum Fund Law says that the Government must give a justification based on long-term interests if it wants to withdraw more than the ESI from the Petroleum Fund, but unfortunately Government and Parliament do not take this provision seriously when they approve budgets which withdraw more than ESI. Unfortunately, this argument, while it sounds good, is not reflected in the structure of the budget. The majority of funds are allocated to projects with dubious returns, and which mostly benefit foreign companies, rather than the people of Timor-Leste. We think that this is a betrayal of the principles of the Petroleum Fund, which was intended to be spent according to the principles of good governance to benefit current and future generations. Out of the total budget of $1.562 billion, $1.284 billion will be withdrawn from the Petroleum Fund. The Government calculates the 2016 ESI to be $545 million, so the amount taken will be $739 million more than ESI. This is 7% of Timor-Leste’s remaining petroleum wealth, the highest percentage ever withdrawn from the Fund. In the rectified 2015 budget, the Government will withdraw $689 million above ESI, while this year’s budget proposal shows that the Government will continue taking much more than ESI in coming years: in 2017 the Government wants to withdraw 8% of Timor-Leste’s oil wealth, and in 2018 and 2019 it will take out 11%. An important point that we wish to make to the distinguished Deputies is this: the balance in our Petroleum Fund has begun to fall, the return on our investments have been negative over the last year, and our future oil and gas revenues will be lower than we anticipated a year ago. The Central Bank of Timor-Leste recently published its latest quarterly report on the Petroleum Fund, showing that the balance at the end of last quarter is lower than it was sixteen months ago. This is because the value of the Fund’s investments dropped by $250 million between January and September 2015, while the Government withdrew $639 million to finance its activities during the same period. The balance of the Fund is now lower than in June 2014. In addition, oil and gas revenues to the Fund totaled only $218 million in the third quarter of 2015 -- less than half the quarterly average during 2014, and 63% lower than in 2013. However, the Government’s calculations of 2016 ESI (page 44), done in June, are too high. For example, the end-of-2015 balance in the Petroleum Fund is likely to be $15.9 billion, not the $16.6 billion suggested in Budget Book 1. This change alone will reduce ESI by $21 million every year, and continuing low oil prices will probably reduce it further. Although the budget books discuss the reduced revenues from low world market oil prices, they do not consider reduced profitability which has caused Kitan to shut down 10 months earlier than planned. This could have a similar effect on Bayu-Undan, and if low prices continue, it will be harder to start up new fields in the future. Timor-Leste’s debt is increasing - this burdens future generations. Timor-Leste has already signed $210 million in loan agreements with JICA, ADB and the World Bank, all for road projects. However, the proposed 2016 budget includes plans to spend more than $1 billion in borrowed money between 2016 and 2020 (including $821 million in 2016-2018), in addition to $29 million in 2015. This is a huge increase over the loans anticipated in the 2015 budget, which projected only $610 million in loan spending between 2015 and 2019. In addition to fixing roads with borrowed money, the proposed budget reveals Government plans to borrow for the Tasi Mane Project ($163 million for the Suai Supply Base and $255 million for the South Coast Highway) and upgrading Dili Airport ($305 million). La’o Hamutuk is concerned that these projects will mainly benefit rich people and foreign companies, while requiring all of Timor-Leste’s people to pay for them over the next thirty or more years. If Timor-Leste continues to take out more loans while neglecting productive sectors or wasting money on projects with uncertain return, we won’t be able to pay back the money. Many other countries have borrowed too much then been unable to pay back, and going into default often allowed international lenders to take over national sovereignty, resulting in great suffering for their people. We hope that Parliament considers the dangers of going deeper into debt to international agencies. Every loan we take out today will have to be repaid with interest, reducing our future ability to pay for essential programs, which will have to be cut even further. Instead of paying teachers, Members of Parliament and police officers; keeping clinics open or providing rural water supply, our money will be sent to Tokyo, Manila, Beijing and Washington. For the first time, the proposed 2016 budget includes a line in ‘Whole of Government’ for repaying loans -- $250,000, which increases to $292,000 by 2020. Although we do not know the exact amounts, La’o Hamutuk estimates that repayments for the $210 million in loans which have already been contracted will be at least $10,000,000 in 2020 alone, more than thirty times as much as Budget Book 4 predicts. Parliament should ask Government for more realistic and longer-term projections of the costs of debt service for loans already contracted and for those anticipated in the proposed 2016 budget. We need to estimate future spending seriously. The Government’s refusal to make serious projections for Consolidated Fund (CFTL) spending after 2016 is misleading to Parliament, making it difficult for you to analyze medium-term budget implications. Although Article 22.3(a) of Budget and Financial Management Law No.13/2009 requires that the budget documents project the revenues and expenses for two years after the current budget year (that is, for 2017 and 2018). Unfortunately, the projections for CFTL in Book 4A and 4B are not real. Government simply takes the 2016 number on each line and adds 4% to it for each following year. This is not credible for large expenditures like generator fuel, ZEESM, veteran’s benefits and CFTL-financed infrastructure. 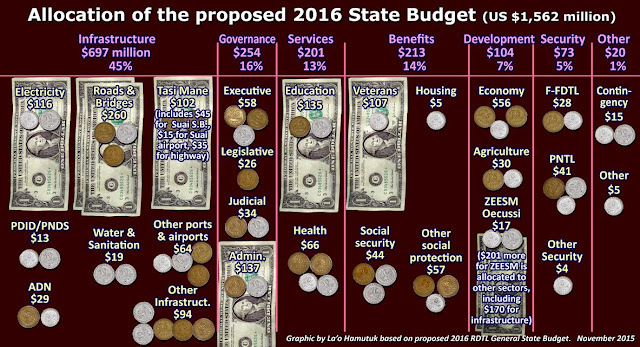 Also, although we understand that many line ministries have difficulties planning and projecting their costs, these four items comprise nearly half of all CFTL appropriations, and several other large lines expenditures could also be projected more accurately. As budgetary demands increase and our wealth shrinks, more accurate predictions are essential. This is especially critical for the Deputies to consider when making decisions about whether Timor-Leste can afford to “invest” in certain multi-year, multi-billion dollar projects. Another issue is that public transfers are not transparent and almost impossible to monitor. Public transfers are now the largest category of CFTL spending, totaling 41% (excluding autonomous agencies). Deputies and the public cannot see how these monies are used (e.g. page 2 of Budget Book 4A), when they are spent (e.g. the Budget Execution Portal), or how much was unspent at the end of the year, to be secretly carried over for the future. Article 145.2 of Timor-Leste’s Constitution prohibits “secret appropriations and funds,” and the transfer of $218 million (14% of the entire budget) to ZEESM violates the spirit, if not the letter, of this Article. The list of autonomous agencies in Annex III does not include three agencies which receive $10.8 million subsidies from the State Budget through Public Transfers from the Ministry of Petroleum and Mineral Resources: TimorGAP, the National Petroleum Authority, and the Institute for Petroleum and Geology. It also omits $10 million to capitalize the BCTL and BNCTL banks, as well as subsidies for other state-supported institutions. The list also no longer includes the electricity generating and distribution system, as EDTL has been merged into the Ministry of Public Works. The Directorate-General for Electricity in MOPTC will receive a $103.5 million appropriation for operations and maintenance, plus $6.3 million more through the Infrastructure Fund, while another $6.6 million goes to ZEESM for generator fuel. Timor-Leste expects to collect only $23 million from electricity consumers during 2016, and this 80% subsidy for electricity users primarily benefits rich people, who use many more kilowatt hours. The Tasi Mane Project should be re-evaluated. The proposed budget allocates $102 million for the Tasi Mane Project and TimorGAP, of which $45 million is for the Suai Supply Base, $15 million is for Suai airport, and $35 million more is for the highway from Suai to Fatukai/Mola. For several years, La’o Hamutuk has expressed concern about the viability of this project, and its total cost could add up to more than ten billion dollars. In August 2015, the Government signed a $719 million contract with Korean company Hyundai Engineering & Construction to build the Suai Supply Base. In October, the Court of Accounts ruled that the contract was illegal, although the Government is appealing the decision. La’o Hamutuk estimated the economics of the Suai Supply Base based on Bayu-Undan procurement, and we believe it will have to supply at least five new fields the size of Bayu-Undan in order to recover an $800 million investment, even before making any profits. Kitan is currently being decommissioned, and Bayu-Undan will continue production for only five years more. It is already dropping: monthly production levels were 27% lower in the first eight months of 2015 than in 2012. In addition, while Greater Sunrise could potentially provide considerable revenues to Timor-Leste, its future is uncertain, and no other commercially viable fields have been discovered since independence. We therefore urge the Government not to allocate more money to projects whose legal status is currently being questioned by the Chamber of Accounts, and whose returns are uncertain given the lack of new oil fields in Timor-Leste. ZEESM continues to ride a wave of dollars. In this proposed budget, ZEESM will receive $218 million as a Public Transfer, 63% more than in 2015. Out of this, $170 million is allocated for Capital Development. The largest part of this money – $81 million – is allocated to build and continue road construction that started in 2014. Millions more are allocated to other projects, including $51 million for the airport, $10 million to implement ZEESM in Ataúro, and $3.5 million to buy a passenger ferry. Although Book 3B of the proposed budget gives a list of allocations for the Oecusse/Ataúro Regional Authority (RAEOA), La’o Hamutuk remains concerned that ZEESM funds are appropriated as Public Transfers, and therefore Parliament cannot see or decide what the money will be spent on. The budget books also show that RAEOA took in $3.3 million in revenues during 2015. These are kept in RAEOA’s account, and are not transferred to the Ministry of Finance to include in the State Budget. We understand that the National Parliament has authorized RAEOA to manage its own procurement, revenues and spending. Therefore, we suggest that Parliament review the legal framework applicable to ZEESM, change the budget allocation mechanism so that it is no longer done as a Public Transfer, and demand that the Government reveal its plans and feasibility studies for ZEESM before more funds are approved for 2016 and beyond. We share the Government’s and consumers’ relief that inflation has fallen almost to zero, but it should actually be negative. During the last year, the US dollar has increased 11.5% compared to the rupiah, 18.6% compared to the Australian dollar and 9.1% compared to the Singapore dollar. Inflation in Indonesia, for example, is currently 6.2%, so the prices of things we import from there should have dropped by 5%. However, the Directorate-General of Statistics reports that prices here increased slightly during the last year. In our letter to Prime Minister Dr. Rui Maria de Araújo last February, we suggested that, considering global market conditions, especially in countries which export to Timor-Leste but do not use the U.S. dollar, Timor-Leste should be able to buy things cheaper. Otherwise, importers reap the benefits of the reduced cost of imports, rather than the Government and individual consumers in Timor-Leste. Therefore, once again, we urge Parliament to ask the Government to ensure that its spending on imported goods changes according to the global market, taking advantage of possible gains from changes in exchange rates. We must take this opportunity to reduce our spending now, before the advantage is lost, and thereby increase the economic strength of our people. Timor-Leste has had ten years of significant oil income, and this money will last for about ten more years. We’ve received $20.7 billion in oil and gas revenues, and expect $1.7 billion more before Bayu-Undan shuts down in 2021. We’ve also received $2.4 billion in investment returns, although current returns are negative. We’ve already spent $6.7 billion of our petroleum wealth, and have saved $16.4 billion for the future. In ten more years, it may all be gone. What will we have to show for it?